Neiman Marcus is an American luxury specialty department store where consumers find the latest fashion right off the runway. With Big Apple Buddy’s personal shopping service, you can now buy direct from the USA Neiman Marcus online store anytime, anywhere. At Nieman Marcus, you can find the biggest names in the world of dresses and gowns like Dolce & Gabbana, Naeem Khan, and Giorgio Armani. 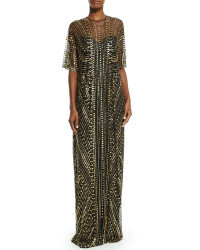 The Embellished Metallic Caftan Gown by Naeem Khan, manufactured in Italy, is made out of Indian-inspired beaded silk material with a daring jewel neckline. This gown has an elongated hem that will sweep the floor with its elegance. With its elegant yet subtle feminine look, you’ll look like you walked straight off the red carpet! Looking for some stunning Louboutin or Valentino shoes to spice up your style? Well, look no further! Nieman Marcus has a pristine collection of boots, like the Top Croche Over-the-Knee Red Sole Boot, to go along with your most elegant outfit. You’ll be sure to make a statement with this knee-high leather boot and signature Louboutin vibrant red-lacquered soles with a 4.8’’ covered heel. It's the one heel you wouldn't mind showing off over and over again. Nieman Marcus also has readily available handbags from exclusive brands from Tom Ford to Prada. The Small East-West Saffliano Tote Bag is a chic handbag with plenty of compartments for your every need. 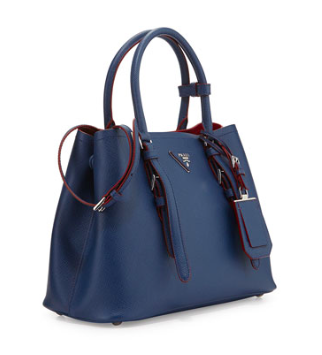 Made out of Prada’s classic leather and manufactured in Italy, this is one of the most distinctive bags in fashion at the moment that you can use on an everyday basis. This tote bag is also versatile with its removable shoulder strap . It’ll be the one walking companion you won’t want to let go off! Unfortunately, the USA Neiman Marcus online store currently only offers international shipping for certain brands. Big Apple Buddy, your personal shopper, however can help you buy any products direct from the official USA Macy’s online store and ship them to your doorstep, no matter where you are in the world. If you would like to buy from the USA Neiman Marcus online store, simply let us know which items you would like to order (by filling out the form on the right) and we’ll get back to you with a free international shipping quote within 24 hours!